Park Forest, IL—(ENEWSPF) — Are you looking for a twist on your fitness routine? How about doing the downward dog among sculptural giants outside in the prairie? 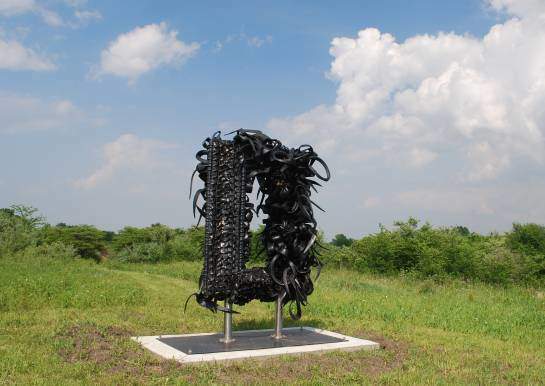 The renowned Nathan Manilow Sculpture Park on the campus of Governors State University is the perfect place to roll out your yoga mat and connect with the beauty of art and nature. This new four-week class, Yoga in the Park, will be held on Saturday mornings from June 10 to July 1 at 10 a.m. Additional information about Yoga in the Park can be found in the ‘Healthy Living’ section. Park Forest will be participating in the 13th Annual Great American Campout on Friday, June 23. Whether this is your first camping experience or you and your family are seasoned campers, this event is a great way for friends, families and children to connect with nature, sleep under the stars and create memories of outdoor experiences. There are a limited number of camp spaces available so early registration is a must to avoid being disappointed. You’ll find additional information about the Great American Campout in the ‘Arts & Entertainment’ section. Beginning Monday, June 5, no parking will be allowed on either side of Indianwood Boulevard until road resurfacing has been completed. This process is expected to take four weeks. Signage noting parking restrictions will be posted along the roadway. Residents will need to use their driveways or neighboring streets for parking. For questions, call 708-503-7702. The Village of Park Forest is proud of the drinking water it provides. Our mission is to provide residents with high-quality, safe drinking water that meets or surpasses every Federal and State standard. In 2016, the Village of Park Forest distributed more than 480 million gallons of water to our customers. As mandated by the Safe Drinking Water Act (SDWA), this Water Quality Report details Park Forest’s water sources, the results of water tests, and other information. The information in this report covers the Village’s water operations, January 1, through December 31, 2016. View the Water Quality Report. For questions on this report, contact David A. Vavrek, Chief Water Plant Operator, 708-503-7702, or visit the U.S. Environmental Protection Agency (EPA) website www.epa.gov/safewater. The Village of Park Forest Board will meet on Monday, June 5 at 7 p.m. The meeting will be held at Village Hall, 350 Victory Drive. Residents are encouraged to attend. Board meetings air live on cable access channels (Channel 4 for Comcast subscribers and Channel 99 for AT&T subscribers). Monday, June 5 at 4 p.m. — Google It!. — Demonstration class. Registration is required by calling the library. Monday, June 5 at 7 p.m. — Adult Writing Group — For beginning and experienced writers. Tuesday, June 6 at 10 a.m. — Knot Just for Knitters at Benton St. Bakery — Share camaraderie while working on needlework projects. Tuesday, June 6 at 6 p.m. — Introduction to Cloud Storage — Demonstration class. Registration is required by calling the library. Thursday, June 8 at 6:30 p.m. — CRAVE (Crete Area Voracious Eaters) — Prepare and bring a dish based on the month’s theme of chicken, then share samples and recipes with club members. Thursday, June 8 at 7 p.m. — Knot Another Ball of Yarn! Crochet Group — Learn to crochet, or bring your own crochet. Saturday, June 10 from 9:30 a.m. – 12:30 p.m. — Sit & Knit @ the Library — Bring a project, lawn chair, and snack to share (beverages provided) for World Wide Knit in Public Day. The Crete Public Library will host Dave DiNaso’s Traveling World of Reptiles on Thursday, June 15 from 1 p.m. to 2 p.m. Reptiles may be the most feared and misunderstood creatures on Earth. Many of their species are facing extinction. The Traveling World of Reptiles’ mission is to dispel myths and inform audiences of the value and importance of these animals. The Traveling World of Reptiles show is an entertaining, educational experience for children of all ages, featuring reptiles and amphibians from around the world. While up-close, live and “hands on”, the 60-minute show is also safe and professional. No one is forced to touch or handle the animals if they choose not to. Learn more about the show at http://www.travelingworldofreptiles.com. Registration for this program opens June 1st and is limited to Crete Public Library District card holders only until June 8th. After that date, anyone with a library card may register to attend. For more information, please call the Crete Public Library at 708-672-8017. A pair of smaller exhibitions drawn primarily from the DePaul Art Museum collection, including selections from Chuck Thurow’s 2016 gift, will be on display during the spring exhibitions. “A Matter of Conscience” will run through June 18 and presents works that reflect varying artistic approaches to politically charged content and pressing social issues. Mia Lopez, DePaul Art Museum assistant curator, is curating the exhibition. Featured artists are Siah Armajani, Margaret Burroughs, Alan Cohen, Paul D’Amato, Ester Hernandez, Michael Hernandez de Luna, Max King Cap, Rudzani Nemasetoni, Betye Saar, Aram Han Sifuentes, Andy Warhol and Garry Winogrand. “Stranger Things” will follow from June 21 to August 6 and includes artists who work against representational traditions in sculpture, drawing and painting to create forms that are at once familiar yet difficult to name. Widholm is curating the exhibition. Featured artists are Robert Bladen, Miriam Bloom, Alex Chitty, Chris Garofalo, Magalie Guerin, David Jackson, Paul LaMantia, Sterling Lawrence, Jim Lutes, Sandra Perlow, Richard Rezac and David Richards. Admission is free at DePaul Art Museum, located just east of the CTA’s Fullerton ‘L’ stop. Museum hours are Wednesdays and Thursdays from 11 a.m. to 7 p.m., Fridays from 11 a.m. to 5 p.m., and Saturdays and Sundays from noon to 5 p.m. The museum is closed Mondays and Tuesdays. For more on DePaul Art Museum’s upcoming exhibitions and events, call 773-325-7506 or visit http://museums.depaul.edu/. Monday, June 5 at 7 p.m. – Mindfullness Mondays– Join us each week as we learn how to become more tranquil and mindful in our lives. A craft will be provided. Tuesday, June 6 at 10:30 a.m. – Meet the Gardener — Join our resident gardener Victoria in the Library garden. Identify specimens in our plantings. Harvest flowers and herbs for future PFPL programs. Learn to spot fellow visitors including native butterflies, honey bees, and birds. Tuesday, June 6 at 2:30 p.m. – Drop In Create Craft Zone — Drop in to kids’ zone and see what we are creating today! Tuesday, June 6 at 4 p.m. — Color-Rama! Coloring Circle — Relax a bit and take a load off before starting your homework. Learn different media of art and share your creativity with other teens! Wednesday, June 7 at 2:30 p.m. – Drop In Create Craft Zone — Drop in to kids’ zone and see what we are creating today! Wednesday, June 7 at 4 p.m. – Drop In Coloring for Adults — Our grown-up coloring circle is the perfect way to step back from the stress of everyday life and enjoy some relaxation! All supplies will be provided. Wednesday, June 7 at 4 p.m. – Drop In Days — Do you have some time to spare after school? Stop by Teen Tech Zone for a spur-of-the-moment activity! Thursday, June 8 at 12:30 p.m. — Drop In Create Zone Craft — Drop in to kids’ zone and see what we are creating today! Friday, June 9 at 10:30 a.m. – Butterfly Club — Join us to track butterflies in our backyard including the Monarch! We will learn to identify host nectar plants, collect and raise caterpillars, watch them transform into chrysalides and release butterflies! Registration Required. Children under 7 must have a chaperone. Covered shoes, socks, water bottle and sunscreen recommended. Friday, June 9 at 2:30 p.m. – Drop In Create Craft Zone — Drop in to kids’ zone and see what we are creating today! Friday, June 9 at 3:30 p.m. – Board Game Day — Join us for fun afternoon of wild and crazy fun with our board games. Saturday, June 10 at 11 a.m. — Gardening Workshop Series – Container planting 101. Saturday, June 10 at 1 p.m. – Drop In Create Zone Craft — Drop in to kids’ zone and see what we are creating today! On Tuesday, June 6 at 7 p.m., the Friends of the Library will hold its monthly meeting. The meeting is open to the public. The Friends of the Park Forest Library enhance and support the operations of the library. In order for the Friends to operative, we need your involvement. You can sign up for membership by asking at the Patron Services or Info Zone desk. Also, membership forms can be found on the Library’s website that you can fill out and bring to the library. For additional information call 708-748-3731 or visit www.pfpl.org. The Chicago Sculpture International exhibit will open at PSC’s Christopher Art Gallery on Monday, June 5 and run through Thursday, July 13. A reception will be held at the Gallery on Wednesday, June 7 from 4:30 p.m. to 7 p.m. Both the reception and exhibit are free and open to the public. The exhibit will feature curated works by a cooperative of over 150 sculptors from Chicago, the U.S. and abroad. The group focuses on the advancement and appreciation of sculpture through exhibitions, workshops and collaborations. Gallery hours are Monday through Thursday from 9 a.m. to 3 p.m.; Wednesday and Thursday from 5 p.m. to 7 p.m. on days when the college is open. For additional information, call 708-709-3636 or visit www.prairiestate.edu/artgallery. ‘Solace: Works of Calm, Quiet and Restoration” will open on Friday, June 16 and run through Saturday, July 22. An Opening Reception will be held on Friday, June 16 from 7 p.m. to 9 p.m. Both the reception and exhibit are free and open to the public. The exhibit of drawings, paintings, sculpture and installation pieces by Sherri Denault, Margie Glass Sula, and Patty McWilliams will focus on the interaction, complementing relationships and conversations between the three artists’ works. Creating an environment of stillness through hand-crafted nature-inspired forms, the artists hope their works will serve as a means of contemplation, meditation, and relaxation within a kind of visual sanctuary. They aim to transform the gallery space into a place removed and safe, private and away from the speed and noise of our fast-paced, device- driven and stressful world. As visitors spend time in the space, they may feel it suggests a kind of refuge, shelter or retreat. Within the quiet and secluded haven, they will discover mysterious images of natural forms emerging from drawings and paintings on the walls, delicately interlaced relief and sculpture pieces embedded in tangles of thread and translucent papers, and installations that suspend branches, bones and feathers in states of fragile equilibrium. Denault, Glass Sula and McWilliams, familiar to many in our region, are recognized as dedicated educators and prolific, award-winning artists who have exhibited in numerous regional and national shows and have been involved as gallery directors, jurors and curators for several years. Their shared inspirations in the simplicity, beauty and spiritual power of nature’s patterns and cycles; their commitment to seeking and creating quiet images of unity and balance; and their ongoing experimentation with new materials and means of presenting their images, in both outdoor and indoor venues, have made the joint exhibits of their works compelling destinations and enriching experiences. Curated by Claudia Craemer. Gallery Hours are 11 a.m. to 4 p.m., Tuesday through Saturday. Closed Sunday and Monday. Adult and student groups are welcome to tour our exhibits. More information about the shows and tours can be found on the Tall Grass website, www.tallgrass.org or by calling Tall Grass Gallery at 708-748-3377. The Drama Group is proud to present the Pulitzer Prize-Winning dark drama, ‘Buried Child,’ by lauded American playwright Sam Shepard directed by M.J. Renzi. Performances will be held at The Drama Group’s Milord Studio Theatre on June 9, 10, 15, 16 & 17 at 7:30 pm and matinees on June 11 & 18 at 2:00 pm. Tickets are $20 for adults; $19 for seniors and $15 for students with ID. Group discount rates are also available. Good seats are still available. Tickets can be purchased by calling the Box Office at 708-755-3444 or online http://www.brownpapertickets.com/event/2948298. For directions and other information regarding Drama Group activities, please visit www.dramagroup.org. USG will feature the exhibit ‘Plus One’ through Saturday, June 17. A Closing Party on June 17 from 2 p.m. to 4 p.m. All events are free and open to the public. ‘Plus One’ is the product of the networking and relationships that grew from last year’s Instagraff exhibit. Last year’s artists were offered an invitation to come back and bring a plus one. Several were available to return, but we have made new friends throughout the year as well. Confirmed artists are Alexis Moulds, Bonus Saves, Bore, Brian Shaffner, Burn353, Ethos, Frank Quintero, Glass Cuisine, Hope, Jalen Buford, Joe Nivens, Kneedy, Lisa Gray, Mike Dornseif, Mitchell Dart, Mr. Switch, Nug, Patt Knerr, Penny Pinch, Phybr, Rome Won, Sejah, Steve Rab, T-Money, Therst, Tony Rabit, Wreckzilla. Therst will be doing a blacksmithing demo on June 17 starting at 2:30pm. Stay tuned for more details regarding a closing party for this exhibit on June 17. Gallery hours are Wednesday, noon to 4 p.m.; Thursday, noon to 7 p.m.; Friday, noon to 4 p.m.; and Saturday, 11 a.m. to 4 p.m. For additional information, call 708-754-2601 or visit www.usg.org. 6:30 p.m. – Sky Squad – Dazzling Acrobatic Dunks! Sky Squad, led by Andres Baines (aka Sky Guy) has thrilled millions of fans with their aerial artistry. Dazzling acrobatic flips and twists off mini trampolines mixed with comedy antics, midair passes and dynamic slam dunking deliver non-stop pure energy excitement to audiences of all ages. These talented gymnasts travel to schools, festivals, corporate events, camps and half time shows world-wide. Sky Squad is the official dunk team for the WNBA Chicago Sky. SEMPLE prides itself on its entertaining combination of musicianship and high energy stage performance. Fronted by Keith Semple as seen on Season 9 of NBC’s Emmy award winning show “The Voice”, you will be treated to a nonstop great time! With styles ranging from 70’s Rock to modern pop songs and everything in between, each show is packed with variety and contrast that takes the audience on a generational tour of music genres. SEMPLE features several of their own original songs in almost every show! R-Gang combines musical expertise and showmanship to provide your event with the very best in entertainment. Specializing in Motown/R&B, they’ve played with nationally known artists as Survivor, to writing and recording for groups like The Doobie Brothers & Marvin Staples, the musicians in R-Gang hold years of experience between them. Mike is a one-man variety sensation, a juggler, magician, comedian, unicyclist, balloon artist, and stilt walker who will amaze with his arsenal of talents. Mike will be joined by Margaret Mauthe, a face painter and body artist who creates whimsical faces on bare shoulders or smiling faces, creating what her passion inspires her to do. Chicago’s premier tribute band to Jake and Elwood, The Bluz Brothers are dedicated to the great R&B sounds made popular by Jake and Elwood Blues. It is their mission to carry on the tradition until the BOYS make parole or until incarcerated themselves—whichever comes first! 5:30 p.m. – Touch a Truck! Children love to see and sit in many of the Village’s neat vehicles from the police, fire and water departments. A sampling of entertainment options throughout the Village of Park Forest and beyond! SJE’s Swingin’, Ava Logan and Saalik Ziyad are singin’, bringing the big band era music to life featuring the Southland’s finest musicians. The full ensemble is assembled on stage for a powerhouse performance of classic hits! Generation… “the Sixties Experience”, takes the audience on a Musical, Magical Sight and Sound Flashback to the 60’s, performing the Great Classic Rock hits from the 1964 British Invasion to the American Male and Female 60’s Artists, Including the “Blue Eyed Soul” groups and on through the birth of early 70’s Arena Rock. A GENERATION…”the Sixties Experience” performance is “Where the Action’s at! Everyone is invited for a night on the town! Music, food, raffles, police emergency vehicles and more! Who’s ready for some Farmyard FUN? “Chicagoland’s favorite children’s performer, Miss Jamie, is guaranteed to get the little ones stomping their boots and hollering for more fruits and veggies”. Named “Best Show of the Summer” by preschool directors across the state, Miss Jamie is interactive and engaging, helping kids learn values from life on the farm through song and dance. Animal Houze Band is a versatile music making ensemble that plays everything from Motown classics to jazz standards to R&B. Produced by Darryl ‘Animal” Williams, they have more than 30 years in entertainment and recording and have performed with nationally renowned artists including Chaka Kahn, Angie Stone, Chantay Savage, Rick James, Prince’s funk band Mazarati, Otis Clay and many more. Join the Park Forest Recreation and Parks Advisory Board and Recreation and Parks Department in celebrating the National Wildlife Federation’s Great American Campout, June 23 at 4 p.m. with an overnight campout in Park Forest’s beautiful Central Park. The 13th annual Great American Campout is a nationwide event that connects people with the great outdoors. Whether this is your first camping experience or you and your family are seasoned campers, this event is a great way for friends, families and children to connect with nature, sleep under the stars and create memories of outdoor experiences. Children under the age of 18 must have parent or guardian camping with them. Dog friendly event. Dogs must be friendly, current on shots, picked up after and leashed in camping area. Recreation and Parks will provide grills for cooking, wood for the campfire, s’mores and activities. Campers will need to provide their dinner, breakfast, and tent. Saturday activities include a nature craft as well as practicing useful skills such as camping first aid, camping knots and rope work with Deputy Fire Chief Natyshok and Park Forest Paramedics and compass and map reading skills with Recreation & Parks staff. The Friends of the Library at GSU and the GSU Alumni Association invite community members of all ages to attend ‘Freedom Seekers and the Underground Railroad,’ an all-day bus tour on Saturday, June 10. Led by Dr. Larry A. McLellan, one of the university’s founders and an expert on regional history, the program is an immersive learning experience. American history was written by enslaved people who sought freedom, and it has been shaped by the deep struggle to understand what it is to be free and what it is to be equal. That struggle continues. This program is an introduction to the part of the struggle for freedom that came to be known as the Underground Railroad in Illinois—a multiracial, multicultural network that supported freedom seekers. A chartered bus will take participants to an actual Underground Railroad campground, a historic cemetery, the Robbins Historical Museum, and several other local sites that will help tell the story of the African American flight to freedom from the South in the 19th century. The bus tour runs through Crete, Steger, Chicago Heights, South Holland, Harvey, Riverdale, Blue Island, and Robbins. Along the way, Dr. McLellan will explore and illuminate the history of African Americans in the Southland region, the impact of the Underground Railroad, and the individuals who sought freedom from slavery. Pre-registration for the program is required. The cost is $75 per person, lunch is provided, and proceeds benefit the GSU Friends of the Library. More information can be found at http://www.govst.edu/underground-railroad or by calling 708-534-7892. Are you looking for fun summer activities to keep your kids busy this summer? Let learning and fun continue year round at Prairie State College (PSC). The [email protected] Summer Program at PSC is designed to enhance the problem solving skills of children grades K-6. Participants will use fun, hands-on, STEAM based activities that encourage creativity in the areas of science, technology, engineering, art, math and team building. Additional weeks include inventions, performing arts, and athletics. The program will be held from 8 a.m. to 4:30 p.m., Monday through Thursday, from June 19 through August 3, at the college’s Matteson Area Center, located at 4821 Southwick Drive. [email protected] at PSC offers 7-weeks of fun-filled learning opportunities including an engaging curriculum taught by certified teachers. Each week is tailored to intrigue students and provide them with a chance to explore, build and learn. Half- and full- day options are available. Cost per child for full day is $138 a week, half day is $75 a week, and a 7-week full-day deal is offered for $825. Payment plan options and before and after care are available. New this summer is the Prairie State Star Studded Theatre (PSST), a two-week drama camp, where students will be introduced to playwriting, acting for the camera, improvisation, staging, set design and musical production. The theme is “Follow the Yellow Brick Road” and students will participate in an original performance on June 22. The cost is $199 and will be held at the main campus, located at 202 S. Halsted St. in Chicago Heights. In addition to the full- and half-day options, PSC is offering à la carte, one-day courses with a variety of classes to choose from, including game design, digital filmmaking, Spanish and more. For more information about the [email protected] program, visit prairiestate.edu/kids or call 708-709-3750. Students with classes totaling $100 or more may be eligible for the FACTS deferred tuition payment plan. For more information about FACTS please contact the Business and Accounting Services Office at 708-596-2000, ext. 5720. Access class schedule online from www.ssc.edu to search the Summer Continuing Education Schedule, or call 708-596-2000, ext. 2231. Contáctanos al 708-210-5740 o a [email protected]. SSC will be offering a Free Highway Construction Careers Training Program this summer at their Oak Forest Campus. Orientation and Assessment Testing will be June 20-22 at the Oak Forest Center, with the program set to begin on July 17, 2017. The Highway Construction Careers Training Program has been implemented to increase the number of minorities, women, and disadvantaged individuals working on IDOT highway construction projects. The training consists of an intensive 12-week program to learn the skills necessary for acceptance into the highway construction trades and gives the opportunity for a career with high wage potential. Construction will always be needed for new buildings, roads, bridges, and other structures. Some of the more skilled construction careers such as engineer require higher education while others such as cement masonry can be learned as an on-the-job apprentice. All candidates MUST have a valid driver’s license with them to attend orientation. For more information or to download a copy of the study guide for the assessment test, please visit our website at www.ssc.edu/hcctp, or call 708-708-225-6004, or email [email protected]. Para Información En Español Llame: 708-210-5740. All orientation and assessment testing will be held at the Oak Forest Center. The Oak Forest Center is located at 16333 South Kilbourn Avenue in Oak Forest. The Illinois Department of Transportation, the Illinois Community College Board, and the participating community colleges do not guarantee employment upon trainees’ graduation from the Highway Construction Careers Training Program. MakerGirl is a non-profit start-up founded by students at the University of Illinois in Champaign. They inspire elementary girls to be active in STEAM (Science, Technology, Engineering, the Arts and Mathematics) through 3D printing sessions. Women are underrepresented in STEAM and girls tend to lose interest in STEAM fields around middle school. The MakerGirl program sparks curiosity at an early age by providing an environment for girls to learn, create, experiment, and engage themselves in STEAM activities. MakerGirl is traveling across the Midwest to host 3D printing sessions for girls between the ages of 7-10 to learn more about STEAM, cutting edge technology, and much more. These sessions teach young girls 3D printing, while also teaching them about women leaders in STEAM fields, innovative companies, cutting edge technology, and much more. We want your MakerGirl to come to our session and depart wanting to actively participate in any and all parts of STEAM! Session 1: 9:00am – 11:30 a.m. Session 2: 1:00pm – 3:30 p.m. Registration: Tickets are FREE. Please register at: http://bit.ly/makergirl-ssc or contact [email protected] For more information about all of SSC’s programs, admissions and registration, please visit www.ssc.edu or contact the Admissions Office at 708-210-5718. Jennifer leads students safely through the yoga poses, providing modifications as needed, while challenging physical limits. Jennifer earned her certification for instruction through the Chicago School of Yoga. The four-class series is $50. The drop-in class fee is $15 per class. To sign up, email Gina Ragland at [email protected] or call 708-235-7559. The Park Forest Police Department’s summer youth program, celebrating 20 years this year, is registering now. The Police Athletic Activities Center (P.A.A.C.) is an athletic-based summer youth program for ages 10 to 15, beginning held June 10 to July 27, from 5:30 p.m. to 8:30 p.m., Monday through Thursday evenings, at Rich East High School, 300 Sauk Trail in Park Forest. The program teaches sportsmanship, leadership, and character development through sports activities. For questions, contact Corporal Julius Moore at [email protected] or call 708-748-9536. Applications are available at the Police Department, 200 Lakewood Boulevard. Park Forest People of Faith will gather for Peace Prayers on Wednesday, June 7 at 7 p.m. at St. Irenaeus Church, 8 Cherry Street in Park Forest. All are invited to attend. The group will meet on the first Wednesday of each month. This year’s program will feature concrete steps for further progressive movement building, including candidate training, independent political action, civil disobedience, educational workshops, and unity in mass actions. The program also includes The People’s Speak, prominent actors reading excerpts from American history based on the writings of Howard Zinn. Convening organizations include National Nurses United, People’s Action, United Students Against Sweatshops, People for Bernie, Our Revolution, United Electrical Workers, Color of Change, Progressive Democrats of America, and Democratic Socialists of America, and Presente.